“Solidarnost” foundation is starting a campaign to raise money for the Gasa Strip under siege. The humanitarian situation in Palestine is dire. According to the Health Ministry of Gasa, almost no medications or medical supplies are available, and power outages occur frequently. 386 (!) kinds of most-needed drugs and medical supplies have been used up completely. No gauze, no bandages, no catheters, no surgical gloves. If no help is provided immediately, Palestine will be deprived of another 140 required medications. The Ministry described the mounting crisis as “an unprecedented catastrophy”, having underscored the negative impact that it has for Gasa healthcare system as a whole. Israel continues its air raids against the Gasa Strip under siege. Patients requiring urgent surgery are being delivered into hospitals, where even electricity and fuel for standby generators constantly fall short. Power outages threaten the lives of children in intensive care units, newborns and hemodialysis patients, not to mention the absence of medications for their treatment. Several departments in Palestinian hospitals may have to close at any moment due to the acute shortage of medications and petrol for ambulances. 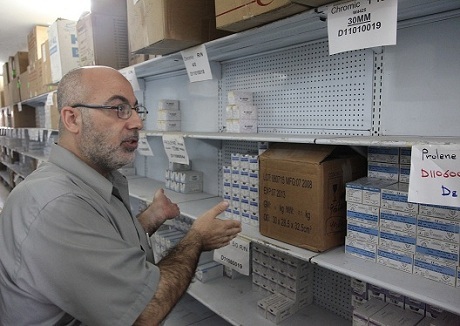 Half-empty shelves at Gasa Health Ministry warehouses. “Our cancer patients are doomed because we are unable to treat them. Our patients suffering from diabetes, astma and other chronical conditions constantly require medications and cannot get them”, Gasa doctors say. The blockade has turned the lives of Palestinians into hell. Currently, around 80% of Gasa inhabitants live below the poverty threshold, and many of them are still unable to rebuild their homes destroyed by the shells. The economic and humanitarian crisis has been hardest on the children. They make out over 50% of the Gasa population. 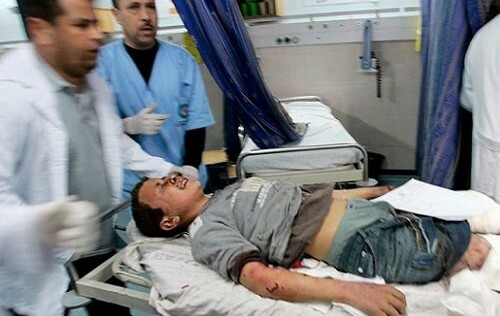 Most young Palestinians suffer from anemia, meningitis and congenital abnormalities caused by chronic malnutrition and chemical warfare that was used by Israel during the war with Gasa. Even those seriously ill and requiring treatment unavailable in Gasa may only leave the Strip on permission of the Israeli army. Receiving the permit takes months, and often it is granted for so short a period that patients do not have the time to complete the course of treatment. Even more often the permit comes too late… Some people die in ambulances right at Israeli checkpoints. Meanwhile, the sieged Gasa continues to be bombed. Israeli military aircraft target “terrorists”; however, they mostly kill civilians. Women and children playing in the street or going to school perish. Israel argues that those are surgical strikes aimed at particular sites – but there are so many of them that the bombings resemble continuous fire that makes homes, streets and hospitals level with the ground. The question is: how do we treat the wounded if even bandages are scarce? 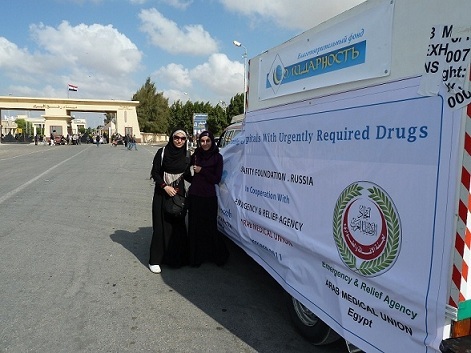 Delegation of the “Solidarnost” foundation carrying medications to Gasa.“Rafah” checkpoint, October 2011. “Solidarnost” foundation is starting a fundraising campaign to provide medications for sick Palestinians. Last year, during Holy Ramadan, you donated 5,000,000 rubles for Gasa under siege. Thanks to your generosity, the representatives of our foundation were able to deliver a humanitarian aid cargo to Gasa and thus provide many Palestinian cancer and cardiac patients with three months’ worth of medications. Meanwhile, the blockade still goes on. Having lived under siege for over half a century, the Palestinians still need our help, mercy and compassion. We want to believe that he will see us!